We serve sustainably raised, locally sourced, seasonal food inspired by the diverse cultural influences that shaped life at Monticello. Farm Table is a café, a source of inspiration and a point of reference. Our offerings include fruits and vegetables sourced from Monticello gardens. 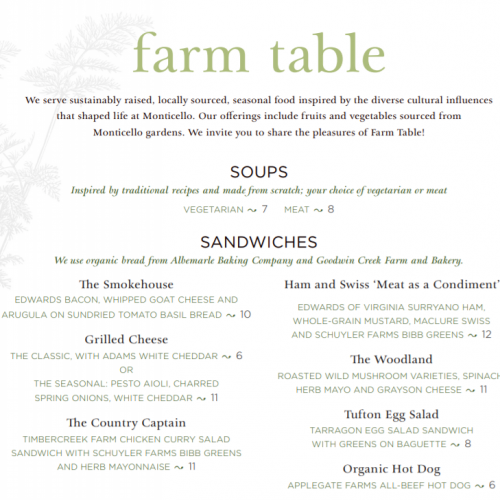 We invite you to share the pleasures of Farm Table. Please enjoy this special offer of up to 35% off when you order any sandwich with side salad* or chips and a drink for $10, including tax. *select one of the daily side salads, which may include potato salad, macaroni salad, coleslaw or a green salad. Offer effective through April 30, 2019. Featuring locally sourced, seasonal food that reflects Jefferson’s enthusiasm for local agriculture, seasonal produce & his reputation for hospitality. Bringing a large group? 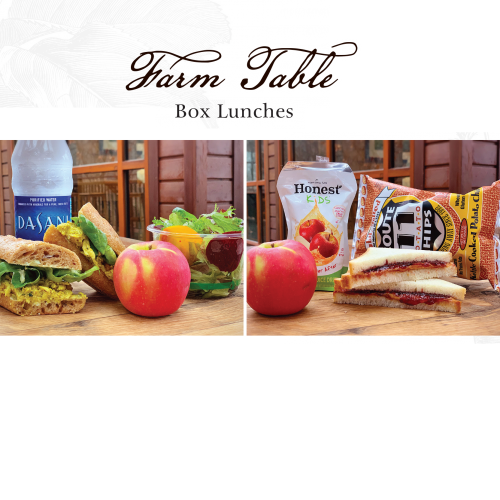 Order our box lunches ahead in advance of your visit. The café operates daily from 9:00am-3:00pm. Breakfast offerings include biscuits, muffins and other light fare. Lunch options include made-to-order sandwiches, homemade soups, salads, quiches and snacks. Coffee, tea, other beverages, snacks and fresh baked cookies and pies are also available. Please call 434-984-7586 with questions and special orders.